"Play an online soccer match with up to 9 friends at the same time"
If you are fan of soccer, and specially soccer computer games, then you know that when you play online, you can't play with several friends at the same time. So if you want to enjoy a real soccer game, in which each player just controls one character, then try this one. Kicks Online is a massive multiplayer online (MMO) excellent soccer computer games that offers superb multi-player support. With this game, you will be able to play with up to 9 friends, of course, 5 in each team. 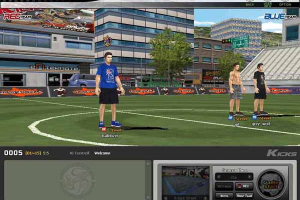 Kicks Online is not based on professional soccer games, but street matches instead. You can play 3v3, 4v4 and 5v5, and you can choose the position of your character: center, midfield or defender. You can fully customize the appearance and skills of your character. For this there are 17 stats you will need to develop or improve by adding point to each, points you win by gaining experience from playing. The game features high quality 3D graphics and cool animations, as well as an extensive tutorial to get you familiar with the game-play.